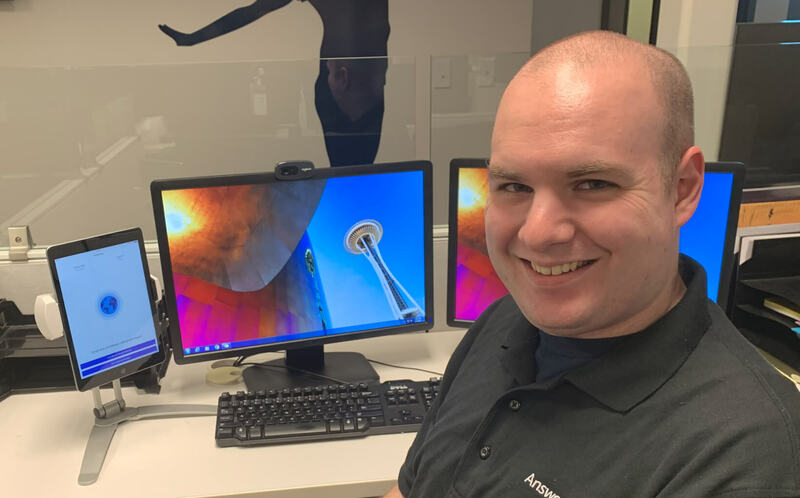 From the Microsoft Disability Answer Desk, Sam is one of the Microsoft support agents assisting Be My Eyes customers who are blind or have low-vision, and make calls to Microsoft through the Specialized Help feature. A typical work day for Sam consists of taking calls on the phone or through the Be My Eyes app from customers, assisting them with everything from troubleshooting general computer problems or issues with a specific Microsoft program. In Sam’s opinion, Be My Eyes has been an effective addition to Microsoft’s classic customer support channels, as the app has been making the troubleshooting experience better for everyone involved. Most people dread calling technical support when their computer has an issue, they have to answer a lot of questions, and it can be difficult to articulate what the problem is exactly, especially for those who are not as familiar with advanced computer features or terminology, and even more so if they are blind or have low vision. Sam explains that the app makes it possible for the technical support agents to see the customer’s screen right away, figure out the issue quickly, and assess if they can walk the customer through it or do a remote connection, which is essentially logging into the customer’s computer to interact with it and help solve the issue. The Be My Eyes app also allows the agents to work with issues they have never been able to before, such as if a customer’s computer is unable to start up or they are having difficulty installing Windows, Sam and his colleagues can see the issue or error message and give troubleshooting advice, or simply tell them if something is broken. Overall, the app makes the entire process of troubleshooting easier and more efficient for both customers and agents and makes getting free technical support a fast and simple process for those who need it. As a technical support professional, I am grateful to have been able to contribute to this service and help people every day. I think it has improved a significant number of people’s quality of life, and I’m glad to be a part of it. The reactions from customers who are blind or have low-vision on Microsoft offering technical support through Be My Eyes have been phenomenal, Sam shares. Most of the customers the Disability Answer Desk talks to through the app are very grateful for the assistance and for the 24-hour availability. Sam and his colleagues are very knowledgeable about Microsoft products and always tailor their service for the assistive tools the customers use. The customers are also appreciative of the time the Microsoft agents take to educate them about how to resolve the issue in the future, or when the agents tell them about features of a program, they may not have been aware of. If a customer needs some extra help or information, Sam and his colleagues will follow up the call with extra information sent via email. We’ve been called lifesavers for restoring someone's email service, so they can send an important business email, or for getting their Skype working, so they can call a family member. Be My Eyes customers who are blind or have low vision located in USA, Canada, UK, Ireland, Australia, New Zealand, Singapore, Hong Kong, Malaysia, the Philippines, India, and South Africa, can call the Microsoft Disability Answer Desk through Be My Eyes Specialized Help 24 hours a day for assistance with their Microsoft products.